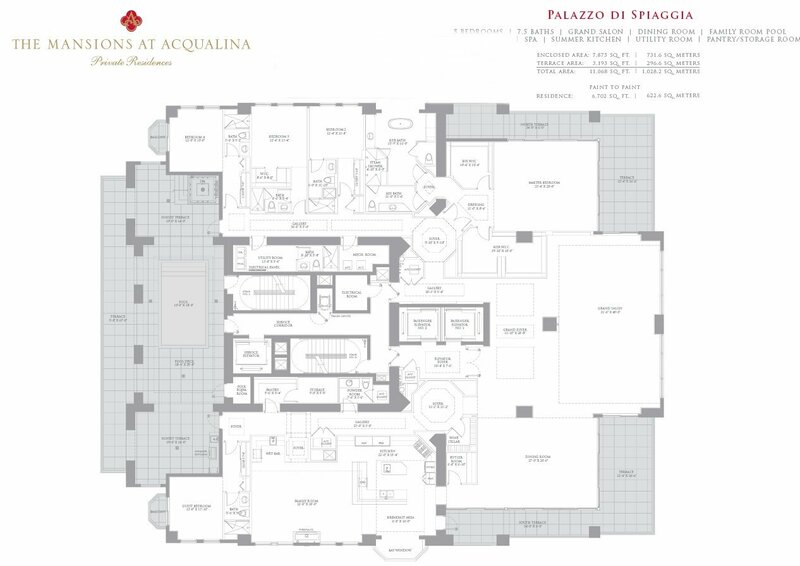 You have five fantastic options when it comes to the floor plans located at the Mansions at Acqualina. First up is Palazzo Di Spiaggia. This floor plan offers five bedrooms and seven and a half bathrooms. It has an enclosed area of 7,875 square feet, and a massive terrace area with 3,193 square feet. It also features a grand salon, dining room, family room, pool, spa, summer kitchen, utility room, and a storage room. 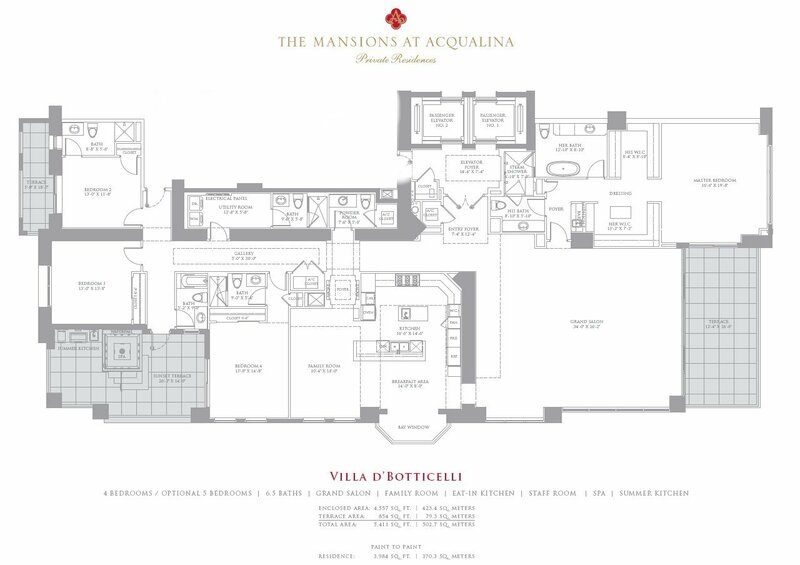 The Villa D’ Botticelli floor plan has four bedrooms and six and a half bathrooms, with the option of five bedrooms. The enclosed area offers 4,557 square feet, and the terrace is 854 square feet. It includes a grand salon, family room, an eat-in kitchen, staff room, spa, and summer kitchen. With the Villa Di Vecchio floor plan, you will have five bedrooms and seven and a half bathrooms. It provides 4,846 square feet of enclosed living space, and a 461 square foot terrace. In addition it offers a family salon, staff room, eat-in kitchen, and a grand salon. 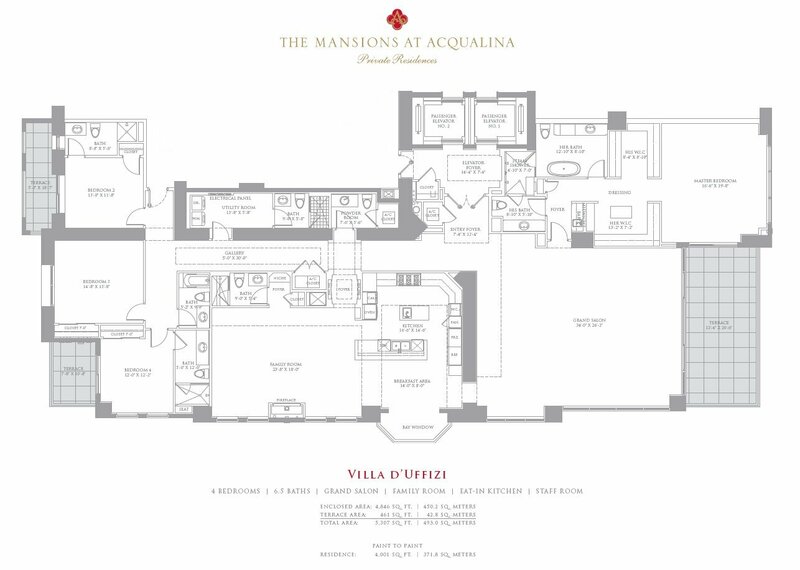 The Villa D’Acqua floor plan is a bit smaller with three bedrooms, with the option of four, and six and a half bathrooms. The enclosed area is 4,557 square feet, while the terrace offers 854 square feet. This floor plan also offers a summer kitchen, spa, staff room, eat-in kitchen, family room, and grand salon. The final floor plan is the Villa D’Uffizi, which offers four bedrooms and six and a half bathrooms. The enclosed area is 4,846 square feet, and the terrace provides 461 square feet. This unit also offers a grand salon, family room, eat-in kitchen, and staff room. If any of these floor plans sounds interesting, get in touch with us today. 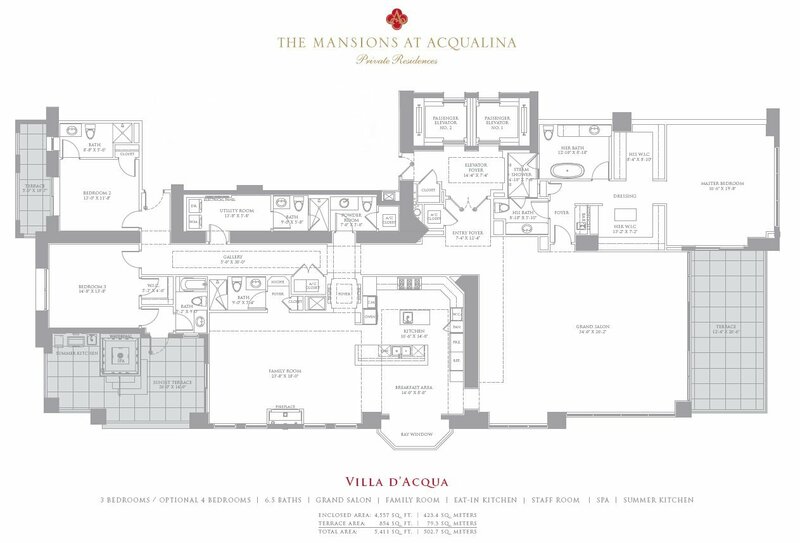 Lana Bell and her associates can let you know about all of the options currently available at the Mansions at Acqualina.